"HOPE’s dream is a growing Church, showing Jesus’ love and telling the Jesus story, at the heart of every community – and there’s a sense, across the UK, that it’s time for a spiritual harvest. "The HOPE 2018 vision is presented in a new 16-page brochure, which explains how churches can be part of HOPE 2018. We’d love you to be involved, making this dream a reality with God's help. Preview the brochure here and order free copies to give away to churches in your area. 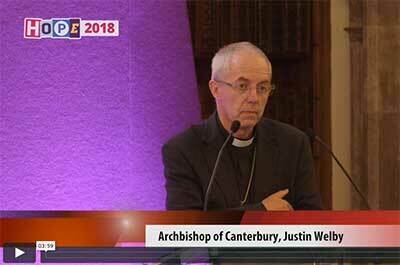 "Speaking at the Lambeth Palace launch of HOPE 2018 this week, Archbishop of Canterbury Justin Welby said 'We exist as God’s people to enable the world to meet Jesus and then make up their minds.'" Watch these clips from the event of Archbishop Justin and Pastor Agu Irukwu, who leads the Redeemed Christian Church of God in the UK. Roy Crowne, Dr Rachel Jordan Wolf, Revd Yemi Adedeji, Kiera Phyo and Phil Timson also spoke at the event. HOPE and their other partners, including INSPIRE's publisher CPO, would love you and your church to get involved to make Jesus known across the UK. We are committed to working with you, providing resources and ideas for a rhythm of mission through the church calendar. Watch out for resources, events and more in the days ahead!